I have a confession to make — I don’t like Guinness. When I first moved to Ireland, I tried to like it, I really did. At my first publishing job in Temple Bar in Dublin, the five of us who worked there would often go to the pub for lunch together, and the man from Manchester who I worked with would sometimes skip food altogether and only have a pint of plain for his lunch. My husband tells the story of how the doctor even told his Irish grandmother to drink it when she was pregnant, saying it would help keep her iron levels up — Guinness is good for you and all that. My first six months here I kept ordering pints of it in the pub in the hopes that it might be an acquired taste, but I could only ever get halfway through them. I officially gave up when I was out with the same publishing crowd at the Stag’s Head in Dublin and one of my co‐workers suggested I order it with a shot of blackcurrant syrup, saying a lot of girls drank it that way. I thought it tasted even worse and could only take one sip before pushing away the glass, and it’s been ales and lagers for me ever since. While I don’t like to drink it straight up, I do like to cook with it. Beef and Guinness go together like bread and butter, and this steak, Guinness and cheese pie from Jamie Oliver gives my favorite beef and Guinness stew a run for its money. You would probably never think of baking with beer, much less in a chocolate cake, but Nigella Lawson pulls it off. I made it for my father-in-law’s birthday back in January and it’s become one of Kelly’s favorites. So all these years later, I’ve started buying Guinness again — though in a roundabout way for the likes of stews and cakes. Sláinte! Looking for more Irish recipes for St. Patrick’s Day? Try beef and Guinness stew with champ, Irish soda bread or Guinness gingerbread. Jamie Oliver’s original recipe calls for lining the bottom of the pie dish with the puff pastry as well, but I simplified it to just cover the top with a puff pastry lid. He also says to add enough water just to cover the beef — I found that I didn’t need to add any at all because the beef was covered enough using only the Guinness, which also meant the pie filling was the perfect consistency and wasn’t too runny. If you don’t have a Dutch oven or an ovenproof casserole with a lid, you can just simmer the beef on the stovetop instead over a low‐medium heat. Preheat the oven to 375ºF (190°C). In a large ovenproof pot, heat a generous splash of olive oil on a low heat. Add the onions and fry gently for about 10 minutes with a pinch of salt so that they don’t brown too much. Turn the heat up, add the garlic, butter, carrots and celery and scatter in the mushrooms. Mix everything together before stirring in the beef, rosemary, a pinch of salt and a level teaspoon of pepper. Fry fast for 3 or 4 minutes, then pour in the Guinness, stir in the flour and add just enough water to cover (I didn’t need to add any water at all, see note above). Bring to a simmer, cover the pot with a lid and place in the preheated oven for about 1 1/2 hours. Remove the pot from the oven and give the stew a stir. Put it back into the oven and continue to cook it for another hour, or until the meat is very tender and the stew is rich, dark and thick. A perfect pie filling needs to be robust, so if it’s still quite liquid, place the pot on the stovetop and reduce, uncovered, until the sauce thickens. Remove from the heat and stir in half the cheese, then season carefully and leave to cool slightly. 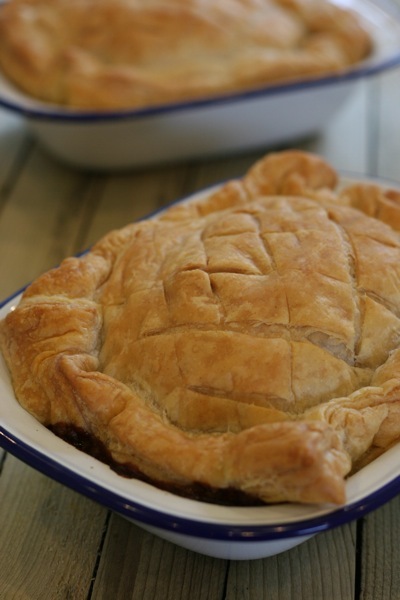 Tip the stew into a pie dish or individual dishes and even it out before sprinkling over the remaining cheese. Cut the ready‐rolled sheet of pastry to fit the top of the pie dish (or individual dishes), rolling it out a little on a lightly floured countertop with a rolling pin if you need to in order for it to cover your dish. Criss‐cross the pastry lightly with a sharp knife. Place it over the top of the pie and tuck it down around the stew. Brush the top with beaten egg, then bake the pie in the oven for 45 minutes, or until the pastry is cooked, puffed and golden. Delicious served simply with peas on the side. Nigella Lawson likes to ice the top of the cake so that it resembles the famously frothy head that sits on top of a pint of stout, but she says it also tastes perfectly good if you leave it uniced and plain. Preheat the oven to 350°F (180°C) and butter and line a 9 inch (23 cm) springform tin. Pour the Guinness into a large pot. Add the butter cubes or slices and heat until the butter melts, then whisk in the cocoa and sugar. In a separate bowl, beat the sour cream with the eggs and vanilla, then pour into the beer and butter mixture. Lastly, whisk in the flour and baking soda. Pour the cake batter into the greased and lined tin and bake for 45 minutes to 1 hour. Leave to cool completely in the tin on a cooling rack, as it’s quite a damp cake. When the cake is completely cold, sit it on a flat platter or cake stand to ice it. Lightly whip the cream cheese until smooth, sieve over the confectioners’ (icing) sugar and then beat them both together. (Alternatively, you can do this in a food processor, putting the unsieved icing sugar in first, and blitz to remove lumps before adding the cheese.) Add the cream and beat again until it’s a spreadable consistency. Ice the top of the black cake so that it resembles the frothy top of the famous pint.